Monday – Spellings to learn – please practise different spelling rules and words that have come up on previous tests. Many of these are also accessible on Spellanywhere. Due 29.4.19. 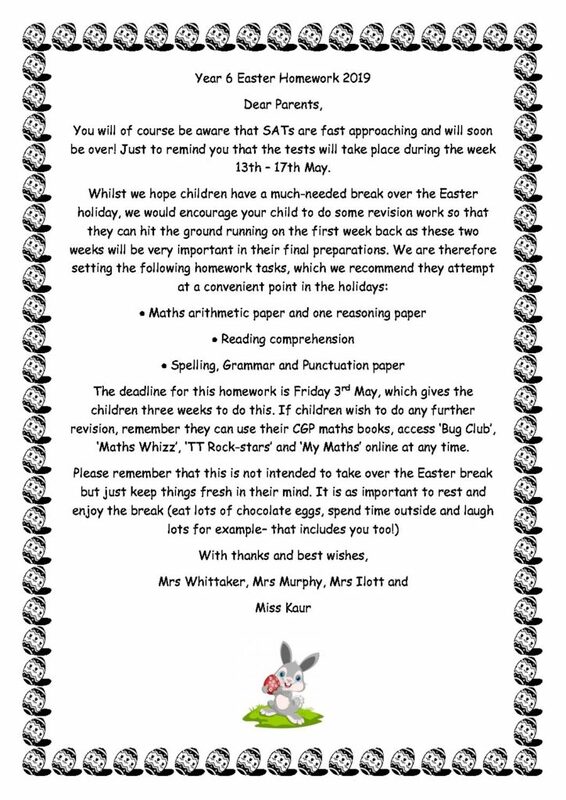 Tuesday – Maths – Please see Easter pack – please complete the arithmetic and reasoning paper ready for the first week back. Please feel free to go on to Maths Whizz and use your CGP book and green books to revise key facts over the Easter period. Due 3.5.19. Wednesday – English – Please see Easter pack, please complete the grammar and reading comprehension sheets in your pack. Due 3.5.19. Have a lovely Easter and a super rest to recharge your batteries– we look forward to seeing you in the Summer term.